On 3rd November 2007, the sky finally cleared. And for the first time, I saw the comet. At first glance with my naked eyes, it appeared like a bright star. But it was also big, that if you were to look carefully, it reassemble a globular cluster. I managed to take some images. Due to its brightness, it is possible for all of you to take an image of the comet, with most cameras. You may need to set your ISO to roughly 400-800ASA and 10 - 20 seconds exposure. That easy. 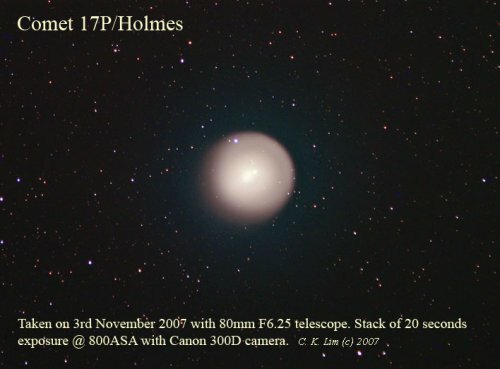 There will be a special Comet 17P/Holmes observation at my observatory on Saturday, 10th November 2007. Email me for direction or call directly at 012-431 7980.